Cook C, Brown C, Isaacs R, Roman M, Davis S, Richardson W. J Man Manip Ther. 2010;18(4):175-80. No cluster of tests has proven to be more beneficial than any singular test for identifying cervical spine myelopathy. This study attempted to find a cluster of predictive clinical findings using imaging confirmation after making a clinical diagnosis in hopes of developing a reference standard for CSM. Many tests have been studied that have a high degree of specificity and can rule in the diagnosis of CSM; however, not many have a high sensitivity, which would help rule this diagnosis out. The tests with a high specificity are clonus,6 Hoffman sign,7-9 hyper-reflexic deep tendon responses,7,8,10 inverted supinator signs,7,11 and Babinski sign.12 When these tests are used alone, they may lead to false negatives and occasionally false positives.7 When tests are clustered together, they can help overcome the weakness of stand-alone tests. Data was taken from 249 patients with cervical spine dysfunction from multiple conditions seen at Duke University from 2006 to 2009. All participants were diagnosed with CSM by an orthopedic surgeon dependent on a patient’s history and physical examination. The patient’s history consisted of deep aching pain in the neck, arm or shoulder joint that can be unilateral or bilateral, gait dysfunction resulting in clumsiness or stiffness, loss of dexterity in the hands and stiffness in the neck. The patients also presented with “multisegmental weakness, losses during coordination testing, and variable losses of sensation and proprioception.” When a clinical diagnosis was suspected, an MRI was done to confirm or deny the diagnosis of cervical spine myelopathy. Each participant in this study had positive MRI findings to confirm diagnosis of CSM. According to many studies, the diagnosis of CSM by MRI is confirmed with a reduction in the anterior-posterior width, signal changes noted in the cord, complete obstruction of the subarachnoid space, and cord compression noted with cross-sectional views on imaging.13-17 Patient’s demographic information, pain scale, neck disability index (NDI) and SF12, which is an outcome measure used to determine a person’s quality of life, were recorded and utilized as descriptive variable. The predictive variables for the study included gait disturbances (abnormally wide-based gait, spastic gait, or ataxic gait), increased reflexes at the C5-6 level, abnormal brachio-radialis reflex (an inverted supinator sign), increased lower extremity reflexes, Hoffman, Spurling’s test or Babinski, the distraction test, clonus, and pain scores. Thirteen clinical findings were studied including: pain score, pain consistency, age > 45 years old, hyper-reflexia of the lower extremity reflexes (quadriceps and achilles) as well as C5,6 reflexes in the upper extremity (biceps and inverted supinator sign of brachioradialis), Spurling’s test, Hoffman’s test, clonus, Babinski, distraction test, and gait deviation. Five clinical findings were identified in the study (gait deviation, Hoffman’s test, inverted supinator sign, Babinski test and age > 45 years old) to be good predictors of CSM. The patients in this study displayed high specificity for ruling in CSM when 3-4 of these 5 identifiers were present. Also, there was high sensitivity for ruling out CSM when only 1 of the 5 clinical findings was present. These clusters may be useful in helping a clinician identify patients with CSM. Many patients present to physical therapy for gait disturbances, which can be one of the initial complaints with a patient with cervical spine myelopathy. Clinicians should to be aware of certain questions and objective measures to clear patients with this diagnosis. The consistency of the IAOM-US evaluations, based on Cyriax’s teachings, is to perform a systematic evaluation every time while performing the least amount of testing for the most amount of information. In doing the same evaluations each time, it is much easier to quickly identify discrepancies with these patients. When performing a cervical evaluation, it is already recommended to perform upper extremity and lower extremity reflex testing as well as a Babinski as a quick screen. Adding the performance of the Hoffman’s test can help rule in CSM. In addition to the objective findings, the patient can quickly be assessed for gait deviations as he/she walks into your clinic for the initial examination. Very easily and quickly, these 5 clinical findings that form a cluster with high specificity for a diagnosis of cervical spine myelopathy can be identified and the patient can be referred back to the physician for appropriate treatment. Grasp the patient’s middle phalanx of the 3rd digit then flick the patient’s distal phalanx into flexion. A positive test is flexion of the interphalangeal joints of the thumb and index finger. The arm is placed in a neutral position, allowing the natural ulnar deviation to occur. Strike the brachioradialis tendon near the radial styloid process. 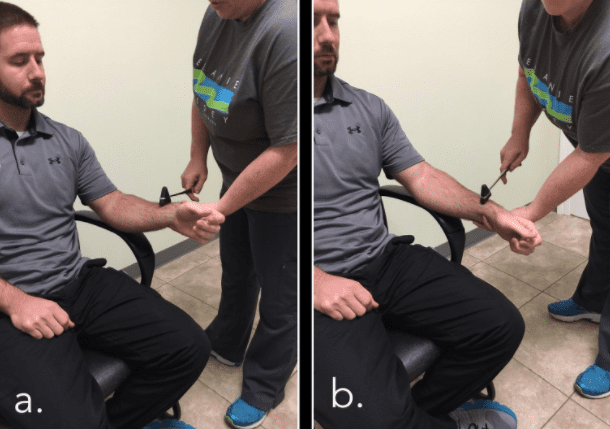 A positive test is flexion of the fingers. Use the pointed end of the reflex hammer along the plantar surface of the foot then swipe lateral to medial across the ball of the foot. A positive test is great toe extension and splaying of the other digits. Kalsi-Ryan S, Karadimas SK, Fehlings MG. Cervical spondylotic myelopathy: the clinical phenomenon and the current pathobiology of an increasingly prevalent and devastating disorder. Neuroscientist. 2013;19(4):409-421. Bednarik J, Kadanak Z, Dusek L, Novotny O, Surelova D, Urbanek I. Presymptomatic spondylotic cervical cord compression. Spine 2004;29:2260–9. Northover JR, Wild JB, Braybrooke J, Blanco J. 2012. The epidemiology of cervical spondylotic myelopathy. Skeletal Radiol 41:1543–6. Harrop JS, Hanna A, Silva MT, Sharan A. Neurological manifestations of cervical spondylosis: an overview of signs, symptoms and pathophysiology. Neurosurgery 2007;60(1 Supp1.1):S14-20. Fukushima T, Ikata T, Taoka Y, Takata S. Magnetic resonance imaging study on spinal cord plasticity in patients with cervical compression myelopathy. Spine 1991;16(10 Suppl.):S534–8. Young WF. Cervical spondylotic myelopathy: a common cause of spinal cord dysfunction in older persons. Am Fam Phys 2000;62:1064–70,1073. Cook C, Hegedus E, Pietrobon R, Goode A. A pragmatic neurological screen for patients with suspected cord compressive myelopathy. Phys Ther 2007;87:1233–42. Cook C, Roman M, Stewart KM, Leithe LG, Isaacs R. Reliability and diagnostic accuracy of clinical special tests for myelopathy in patients seen for cervical dysfunction. J Orthop Sports Phys Ther 2009;39:172–8. Emery SE, Bohlman HH, Bolesta MJ. Anterior cervical decompression and arthrodesis for the treatment of cervical spondylotic myelopathy: two to seventeen-year follow-up. J Bone Joint Surg (AM) 1998;80A:941–51. Denno JJ, Meadows GR. Early diagnosis of cervical spondylotic myelopathy: a useful clinical sign. Spine 1991;16:1353–5. Estanol BV, Marin OS. Mechanism of the inverted supinator reflex: a clinical and neurophysiological study. J Neuro Neurosurg Psych 1976;39:905–8. Ghosh D, Pradhan S. ‘‘Extensor toe sign’’ by various methods in spastic children with cerebral palsy. J Child Neurol 1998;13:216–20. Matsuda Y, Miyazaki K, Tada K, Yasuda A, Nakayama T, Murakami H, et al. Increased MR signal intensity due to cervical myelopathy — analysis of 29 surgical cases. J Neurosurg 1991;74:887–92. Matsumoto M, Toyama Y, Ishikawa M, Chiba K, Suzuki N, Fujimura Y. Increased signal intensity of the spinal cord on magnetic resonance images in cervical compressive myelopathy —Does it predict the outcome of conservative treatment? Spine 2000;25:677–82. McCormick WE, Steinmetz MP, Benzel EC. Cervical spondy- lotic myelopathy: make the difficult diagnosis, then refer for surgery. Cleve Clin J Med 2003;70:899–904. Al-Mefty O, Harkey LH, Middleton TH, Smith RR, Fox JL. Myelopathic cervical spondylotic lesions demonstrated by magnetic resonance imaging. J Neurosurg 1988;68:217–22. Wainner RS, Fritz JM, Irrgang JJ, Boninger ML, Delitto A, Allison S. Reliability and diagnostic accuracy of the clinical examination and patient self-report measures for cervical radiculopathy. Spine (Phila Pa 1976) 2003;28:52–62.